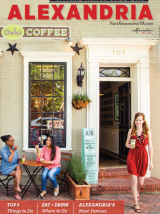 Alexandria, VA (June 1, 2012) -- A new reader poll conducted by AmericanStyle magazine ranks Alexandria, Virginia, fourth among the nation&apos;s best arts destinations. Rising from an 8th place ranking last year, Alexandria beat out the 2011 mid-size cities winner, New Orleans, well as perennial favorites Savannah, Miami, and Charleston. The top three spots went to St. Petersburg, Dayton, and Tampa. Alexandria has had a top 10 ranking since 2010. AmericanStyle magazine is a national publication that focuses on art, craft and travel and is a resource for artists and art enthusiasts. It features the top arts events across the country, highlighting select destinations and profiling individual artists. "This outstanding accomplishment is a result of a community wide effort," said William D. Euille, Mayor of Alexandria. "Securing Alexandria as a top destination promotes the vitality of the arts in our city and attracts visitors, whose spending in our local businesses generates tax revenue supporting the quality of life residents enjoy." Alexandria is home to the internationally renowned Torpedo Factory Art Center, as well as an eclectic collection of art galleries, a public art collection of more than 40 works of art, and the Art League, one of the nation&apos;s largest and oldest multi-service organizations for artists. The city&apos;s Fall Arts Jubilee features a spectrum of signature events throughout the city, from outdoor art festivals to indoor performances, exhibitions, and films. With high-quality arts activities taking place year round, Alexandria is an attractive destination for visitors. "It is an honor to be among the top five arts destinations," said Pat Miller, Chair, Alexandria Commission for the Arts, "the city has truly made a name for itself with public art, art festivals, events and galleries. We are proud of our vibrant arts scene and look forward to sharing it with others." For additional information on arts in Alexandria, contact Cheryl Anne Colton at cherylanne.colton@alexandriava.gov or 703.746.5565. For additional information about Alexandria as an arts destination, contact Claire Mouledoux at cmouledoux@visitalexva.com or 703.652.5367 or go to www.visitalexandriava.com/.